If you would like to advertise your RPG and help support Forum Roleplay, the RPG advertisement program can help! 88×31 banner displayed in footer and sidebar of most of Forum Roleplay’s forumroleplay.com pages (Topsites, Tumblr, Twitter, etc. 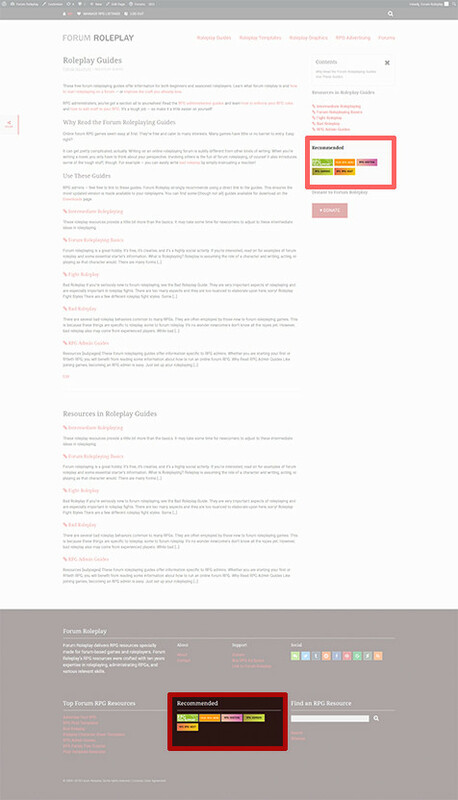 not included, and certain forumroleplay.com pages may not display the sidebar, such as the Template Generator). 88×31 banner displayed on the top of the RPG List and all categories — and you’re still in the sidebar and footer of the RPG list. Lifetime Google ad-free account on forumroleplay.com. You won’t see Google ads anymore, just our custom 88×31 advertisements. Hyper-targeted audience consisting of forum and text roleplayers. Who views this site? People who like roleplaying! Who do you need to join your site? People who like roleplaying! 6700+ pageviews per month average over two years. Active since 2002 — in current form since 2009 and in “some form” since 2002. ~1600 user social reach including ~900 Twitter followers, 375+ Tumblr followers, 190+ Pinterest followers, 90+ Reddit subscribers, and ~50 Facebook followers. I will review your form submission. I will send you an invoice. I put up your advertisement. Your advertisement’s timer only starts when I activate your ad. If you click "Premium Upgrade" on your RPG management page, we will try to automatically fetch your RPG information. I understand I am requesting a paid service. I certify I am at least 18 years old and able to enter a contract to pay. Additionally, I certify that I have a PayPal account and sufficient funding to make payment. I understand advertisement payments are non-refundable. I have read and agree to the Advertising Terms of Service. Both Parties warrant that they have the necessary power and approval to enter into this Advertising Agreement. Both Parties warrant that they are not aware of anything in their reasonable control which will or could have an adverse effect upon their ability to perform their respective obligations under this Advertising Agreement. The Advertiser warrants that he/she will use only those means of advertising approved by the Company and listed in clause 3.1 and the Advertiser undertakes not to use any other means of advertising without the prior written approval of the Company and such approval shall constitute a variation pursuant to clause 3. Where the Advertiser is holding or otherwise controlling an advertising Budget he/she undertakes to use this Budget in its entirety for advertising and not for any other purpose and to return any unused Budget at the termination of this Advertising Agreement. The Advertiser undertakes to pause or stop all advertising on the express instruction of the Company in writing. The Company undertakes to pay all Fees promptly and not to unreasonably withhold payment. The Advertiser warrants that he/she will use only a) material expressly authorised by the Company or b) entirely original material and will not infringe the copyright of any third-party. The Advertiser warrants the he/she will not use any false or misleading statements in their advertisements whether by statement, act, omission or implication. The Advertiser warrants that he/she will not use any vulgar, offensive or disreputable means of advertising. The Advertiser agrees to indemnify and keep indemnified the Company against any and all losses howsoever arising as a result of a breach of clause 1.7, clause 1.8 or clause 1.9. The Advertiser acknowledges that he/she does not have the right to bind the Company. The obligations and benefits under this Agreement may be assigned by either Party provided that the other Party first agrees in writing to said assignment. The failure or delay by either Party to enforce any term of this agreement or to act upon a breach of any term shall not constitute a waiver of their rights. Both Parties warrant that they will not do anything to hinder or adversely affect the execution of the other Parties’ duties under the Agreement. Both Parties warrant that they will submit to the exclusive jurisdiction of the courts and legal system stated in clause 3. The Advertiser shall ensure that any confidential information or material which is obtained during the scope of this Advertising Agreement or in negotiation thereof is kept confidential including but not limited to the details of the means of advertising and the commission due or received under this Advertising Agreement. The Company shall ensure that the details of the Candidate are kept confidential at all times and undertakes not to share this information with any third-parties. The Advertiser undertakes that he shall not expose any confidential information except with the prior written consent of the Company or if directed to do so by a competent Court provided always that such information has not previously entered the public domain by other means. The terms of clauses 2.1, 2.2, 2.3 shall apply indefinitely notwithstanding the termination of this Advertising Agreement. VARIATION Any variation to this Advertising Agreement shall be made in writing and signed by both Parties. NOTICES Any notice served under this Advertising Agreement shall be made in writing and shall be considered served if it is handed to the other Party in person or delivered to their last known address or any other such address as the Party being served may have notified as his address for service. All notices shall be delivered in English. The Advertising Agreement is made under the exclusive jurisdiction of the laws of New Jersey, USA. Disputes under this Advertising Agreement shall be subject to the exclusive jurisdiction of the courts of New Jersey, USA. Notwithstanding the terms of 3.2 both Parties agree that in the event of a dispute they will enter into arbitration before the court before a single arbitrator whose decision shall be final.